An occasional series examining the legacy of the administration of Gov. Dannel P. Malloy and the challenges awaiting his successor, Ned Lamont. The Department of Children and Families wouldn’t trust Andrew Lamkin to care for his son and daughter after the agency removed them from their mother’s custody. He participated in group counseling and took random drug tests, but the child welfare agency was unwilling to take a chance on him. And then he met Joette Katz, who had recently traded in her robe as a justice on the Connecticut Supreme Court for the rough-and-tumble work of running DCF, an agency that draws more and harsher public scrutiny than any other. “After meeting with [her], everything turned around,” he told legislators shortly after Katz took office, describing how she helped him gain custody of his children. Lamkin and his children would be some of the first to be affected by changes in DCF policy under the fledgling administration of Gov. 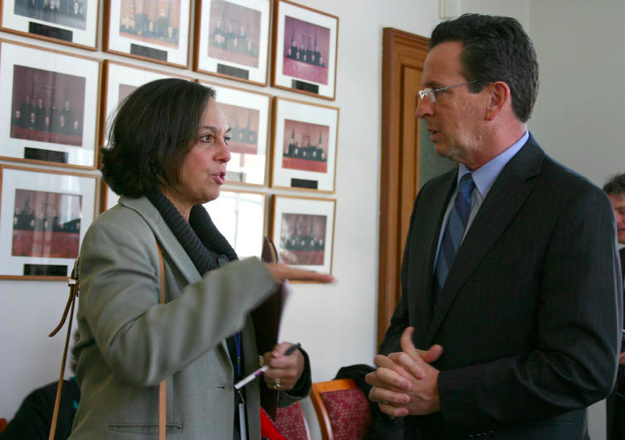 Dannel P. Malloy, whose new commissioner ordered her staff to take more risks. Katz, who served under Malloy for the entire eight years of his governorship, is leaving the agency next month after what is believed to be one of the longest tenures leading a state child-protection agency in the nation. But it wasn’t always easy. Despite Malloy’s loyalty to her, Katz’s abrasive personality, refusal to back down from controversial decisions – even when legislators voiced concerns – as well as her decision to march the child protection agency in a new and sometimes perilous direction, resulted in a rocky eight years. Redirecting the agency to stress family preservation by removing fewer children from their homes – arguably Katz’s most ambitious goal – resulted in the state putting about 500 fewer children into foster care each year, federal data show. But this success was strained by a series of high-profile deaths of children on DCF’s radar. Systemic failures, poor decisions by social workers, and a failure to provide enough social workers for supervision of the at-risk children left in those homes all played a role in the tragedies, critics said, as did the state’s failure to provide enough supports, including programs to address substance abuse and domestic violence. Through it all, however, Malloy stuck by his commissioner – even when doing so was probably not the most politically astute choice. “When high-profile child abuse tragedies happen, most political leaders turn into profiles in cowardice. Gov. Malloy was different. Joette Katz had the courage to make tough decisions. The governor had the courage to back her up,” said Richard Wexler, the leader of the National Coalition for Child Protection Reform. When Katz took the job, she asked staff to think twice before removing abused or neglected kids from their families, rather than taking the safer route of removing them and putting them with strangers in foster homes, out-of-state institutions or group homes. Numerous restrictions that were keeping families apart, such as non-violent criminal records or a history of substance abuse from prior years, were relaxed under Katz. As a result, the number of children entering foster care in Connecticut since 2010 has dipped 19 percent – bucking the national trend, which has experienced a 3 percent increase. And when they do enter foster care, these abused or neglected children are now more likely to be placed with other family members. 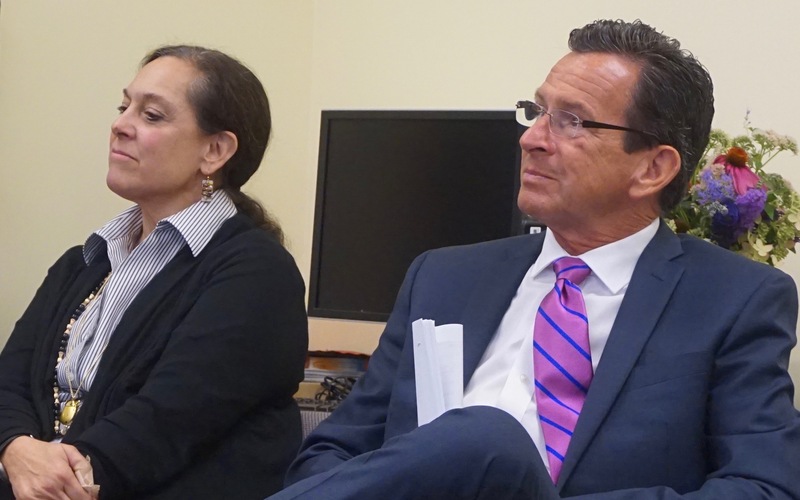 Connecticut’s record of placing children with family members when DCF determined they couldn’t remain at home was among the worst in the nation when Malloy took office in 2011. 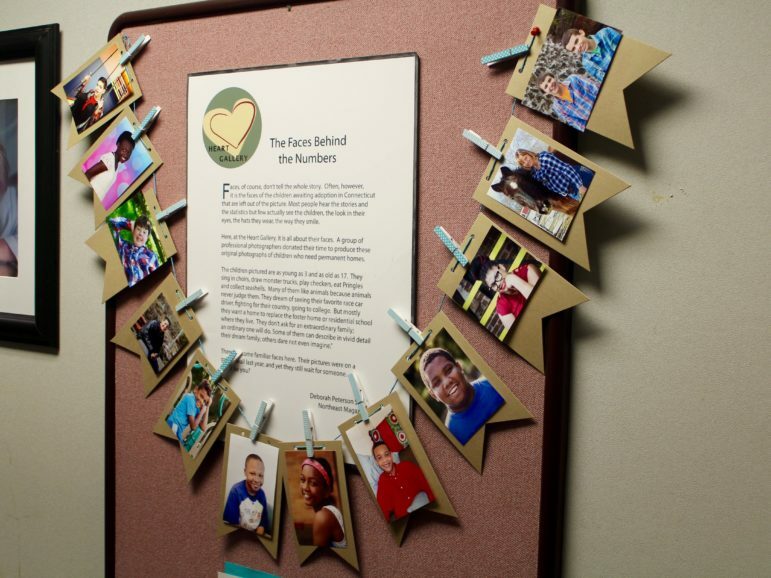 With 37 percent of foster children now living with another family member, Connecticut now has one of the highest rates. Another 7 percent of foster youth live with someone familiar to the child, such as a teacher or coach. Keeping more families together by removing fewer children from their homes and placing them with other relatives when they do need to be removed has resulted in Connecticut having one of the fastest decreases in the number of children in state custody – dropping 16 percent compared to a national increase of 8 percent. 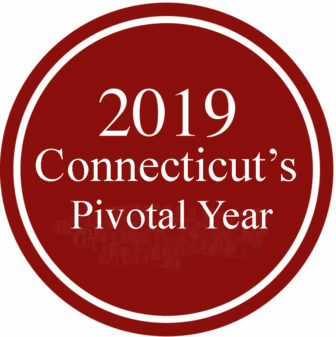 This means that about 700 fewer children are in foster care on any given day now in Connecticut than they were in 2010. Some children didn’t fare well when they were kept with their families, however. The state’s Office of the Child Advocate, an independent watchdog agency, released several reports over the last eight years criticizing DCF for what it termed as systemic issues with the vast agency’s oversight of children who were allowed to remain with their families. In the case of baby Dylan in 2016, DCF staff dismissed the pleas of the relative caring for the child, who repeatedly reached out for help. Agency staff failed to notice months of malnourishment and the child’s near-starvation, nor did they identify a troubling criminal and substance-abuse history in the home where he was placed. In the case of Londyn Sack in 2015, police were called because the 2-year-old, who was under DCF supervision, was found wandering in the snow in a diaper and tee-shirt. DCF had received several phone calls, including one from a police officer, warning that the child’s mother was unfit because of drug use, but the agency had continued to rate the case as low risk. Londyn died a few months later from a drug overdose after consuming a deadly dosage of drugs found in his mother’s home. 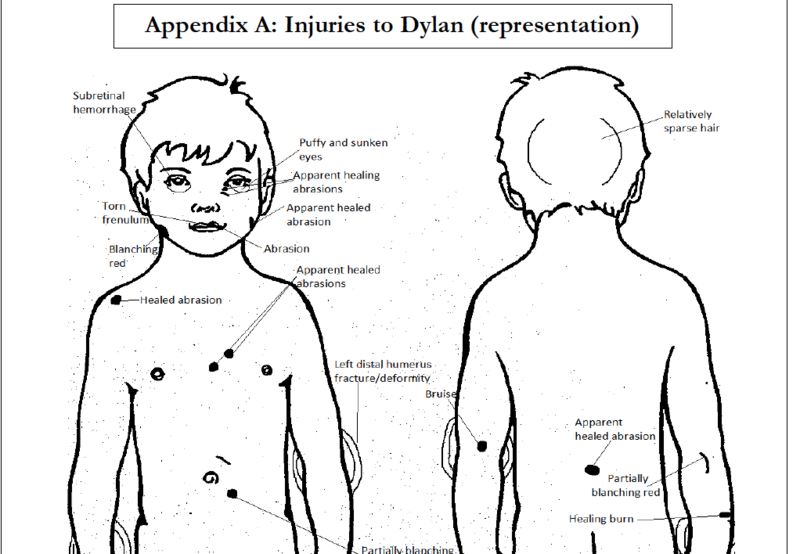 These are far from the only children who suffered harm while in a relative’s care. Advocates agree that leaving children in their homes or placing them with other family members is the best option – but only if proper safeguards are in place and services are available for families. Several advocates are concerned they are not, or that staff caseloads are too high to provide adequate supervision. “Because a child dies in a home with an open DCF case does not mean that keeping families together, as a goal, is ill fated or undesirable,” Sarah Eagan, the state’s child advocate, said in 2014 after reviewing a series of fatal cases her team determined happened in the absence of necessary safeguards. “Some of the cases described in the report raise questions and sometimes significant concerns regarding the efficacy of DCF practice with an individual family or the adequacy of its protocols for ensuring infant safety in high-risk homes,” she said. The federal courts have been overseeing DCF for almost 30 years for failing too many abused and neglected children. The federal court monitor, in his most recent review of the agency in August, reported that many front-line social workers have for years had caseloads too high to supervise at-risk children kept with their families – though a recent wave of new hires will help. He also concluded that wait lists for treatment for substance abuse, domestic violence and other health services also remains an issue. The 120 new workers that the administration recently hired even after the legislature rejected the funding is already having a noticeable impact. “The caseloads for workers are down now so workers can spend more time visiting kids, getting services to the kids, developing treatment plans. So there have been a lot of possitives that have translated directly to better services for kids,” said Martha Stone, one of the lawyers behind the class-action lawsuit that led to federal oversight in 1991. But more social workers isn’t a panacea. 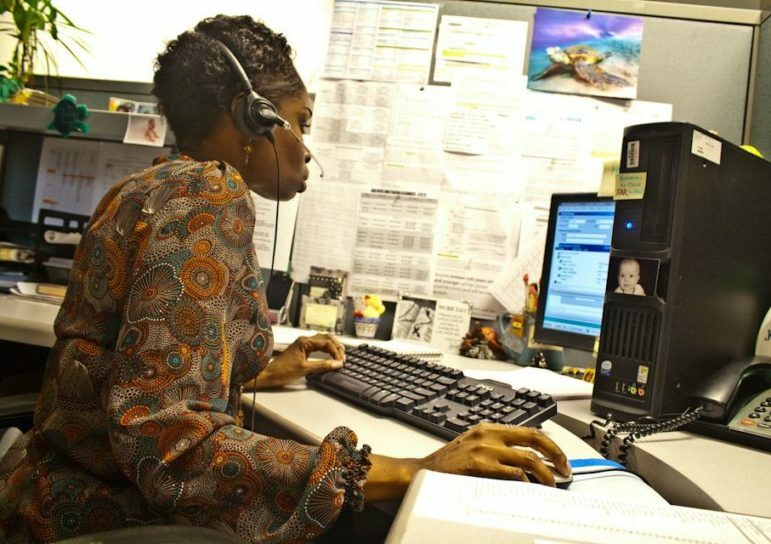 Nana-Kyi Johnson, a DCF social worker, awaits a call at the agency’s hotline, the Careline. Concerns also remain about how the agency handles the more than 50,000 calls to its hotline from people reporting child abuse or neglect. Prior to 2012, an investigation would have been launched, a social worker would have shown up at the family’s home unannounced, and the child would have been questioned. These adversarial visits by DCF social workers often began with the parent refusing to answer questions and ended with the child being removed from the home only to enter the state’s over-burdened foster care system. Now staff at the agency’s “Careline” assess the level of risk through the use of an algorithm and staff expertise to determine how the case needs to be handled. If it is deemed an emergency, staff will respond within hours. If it is low-risk, staff would schedule a time to meet with the family within 72-hours and offer them supports, that they are then able to decline without risking their children being removed from their custody. Of the roughly 13,000 cases sent down this path each year, it was determined in just under half the cases that they don’t need further agency involvement, a review of this approach in 2017 by the University of Connecticut’s School of Social Work Performance Improvement Center found. The center also found that a quarter of the families were offered services but declined them and the remaining cases were referred to various non-profit providers for help. Most cases sent down this route don’t end back up on the agency’s radar in the near future. The UConn researchers report that 26 percent of the cases handled on the low-risk track would get another report against them for abuse or neglect within a year. This flexibility in the handling of cases has become the new norm at DCF, with about 40 percent of cases being diverted down this path. 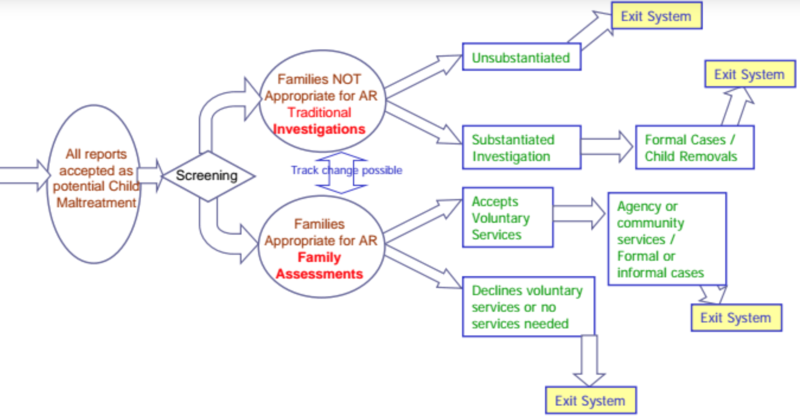 It is a national model known as a Differential Response System(DRS), and Connecticut followed the lead of 20 other states by implementing it’s own version, known as the Family Assessment Route. Republican Gov. M. Jodi Rell’s DCF commissioner, Susan Hamilton, laid the framework for Katz to roll it out. Some high-profile cases that were diverted down this path – including that of Londyn Sack – have raised questions about whether this approach is too hands-off. Sack is one of 17 children who died between 2012 and 2015 after their families were placed on the low-risk path. Seven of those deaths were determined to be the result of maltreatment, UConn researchers reported in 2015. It’s unclear whether there has been an uptick in child fatalities among DCF-involved youth, as federal data is only readily available back to 2012. Katz says these high-profile cases are the outliers involving poor decisions by a handful of staff – not larger issues tied to the reforms themselves. After a couple of high-profile tragedies, Katz restricted more cases from going down the DRS route if certain factors were present. She also emailed her entire, 3,240-person staff to reinforce the factors that would bar placement of a child with a relative without a waiver from her, including any criminal history or substantiated child-abuse allegations. After high-profile fatalities during previous administrations, records show, DCF investigations led to the agency removing more children from their homes and the eventual ouster of the DCF commissioner. Former DCF Commissioner Linda Rossi encountered this in March 1995, during her first few months on the job, with the death of Baby Emily Hernandez. Public backlash in that case led to a steady rise in the number of children placed in foster care, the legislature’s non-partisan Office of Legislative Research reported. “Since the death of baby Emily in early 1995, the [department] has more aggressively removed children from homes where child abuse or neglect is suspected. This policy has stressed a foster care system that provides placements for many of these children,” reads another OLR report. Angelo McClain – chief executive officer of National Association of Social Workers and former commissioner of Massachusetts child welfare agency – agrees. Gov.-Elect Ned Lamont will soon need to decide if he likes where the Malloy administration has taken the agency. Katz — whose rigid nature and position on certain issues fractured her relationships with several key legislators, nonprofit providers and advocates – informed her staff earlier this month that she will not seek to remain in the job under the new administration. 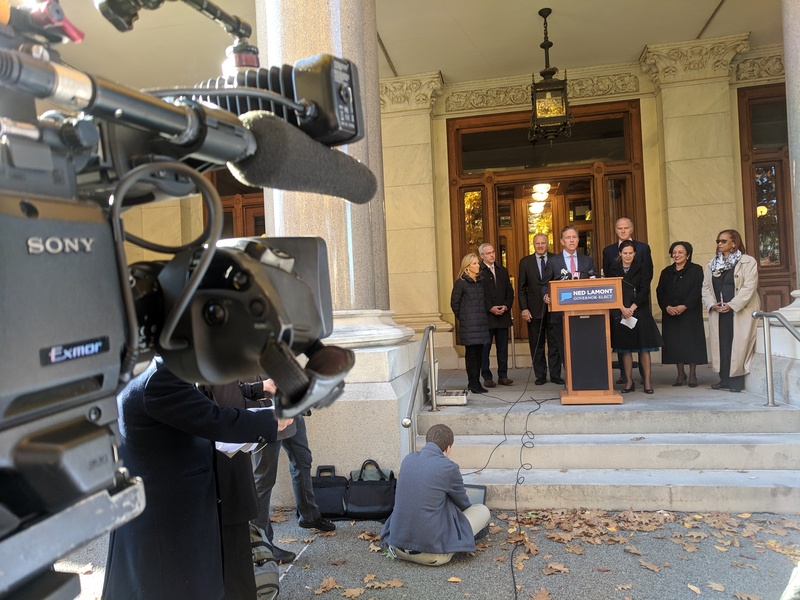 Gov.-Elect Ned Lamont with his transition team and wife talking with reporters. Lamont has not weighed in on the direction of DCF or said what changes he may seek. Requests for an interview on the subject have gone unanswered. Asked about his priorities for the agency during an unrelated press conference at the state Capitol, his response was restrained. State Rep. Toni Walker, one of four co-chairs of Lamont’s transition team, has identified several reforms she would like to see enacted at DCF, including finding ways to retain foster families and evaluate programs. The agency’s current data system was found to be non-compliant in 2014 by the U.S. Department of Health & Human Services’ Administration for Children and Families. A new system that will better help the $770 million agency better track what works – and doesn’t – is currently under development. Katz’s tenure at DCF was, at times, questionable, as support for her frayed among both Republicans and Democrats. While Fasano repeatedly demanded Katz’s removal, the support she once enjoyed from top Democrats also noticeably vanished over time. Walker, a Democrat from New Haven and the House leader of the legislature’s powerful budget writing committee, grew frustrated with Katz’s unyielding approach. “The one thing that can help you is to be more receptive to team building and collaboration. I remember at one point she said to us she has to be the one to make the decisions, and I will never forget this, the commissioner told the committee, ‘Heavy is the head that wears the crown,'” said Walker. At issue on that occasion was Katz’s unilateral decision to open the new jail for girls under DCF supervision at a time when the number of incarcerated boys in Connecticut reached a 10-year high. When pressure mounted for her to reconsider, she dug in and moved forward with the opening of the Middletown facility. Pressure mounted after the dangerous living conditions of a transgender youth living at the facility were revealed, and the state’s child advocate released videos showing staff’s use of restraints on a number of incarcerated children. “She has quite a stubborn streak. She is going to do what she is thinks is right, no matter what anyone says,” said Wexler, of the National Coalition for Child Protection Reform. As tensions mounted, the General Assembly moved to pass a law to force the closure of CJTS. Two years later, the legislature voted to strip the agency of its responsibility for juvenile justice and move it to the Judicial Branch. The legislature also rejected the settlement DCF helped negotiate that overhauled how the federal monitor would grade the agency. “I made some enemies along the way, there is no doubt about it,” said Katz. She said that was the result of her not being willing to fulfill various requests from legislators and advocates that she thought were not in the best interest of the children in the state’s care. She knows the Shakespearean reference to wearing a crown can come off wrong, but she can’t help herself. DCF Commissioner Joette Katz and Gov. Dannel P. Malloy in 2016. But she said nothing would have changed her mind about opening the jail for girls. “Yeah, because I had one facility close, another one with kids backing up, and another with wait lists of 19 kids,” she said. Stone, who brought the federal lawsuit and is now the leader of the Center for Children’s Advocacy, whose lawyers represent DCF-involved youth, said much can be gained from being more open to outside input. For all the criticism surrounding his commissioner, Malloy never flinched. He said recently that sticking with Katz and giving her reforms a chance to work was the right thing to do.